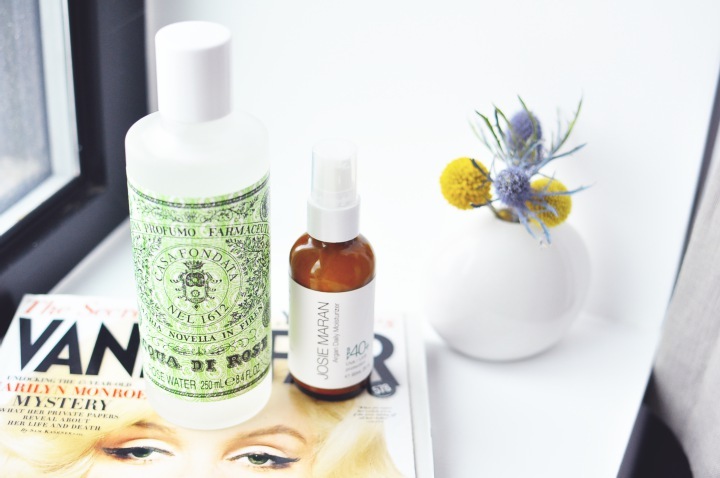 these 2 beauty products are a must in my morning beauty routine. in the morning i splash on some of the rose water onto my freshly washed face. i love the smell of roses that lingers on my face. it feels like waking up to a bed of roses. i mean. . . .what girl doesn't like waking up to fresh flowers? what's great about this is that it comes with a spritzer so you can use it on your linens. i sometimes spray it onto my bed sheets. talk about a bed full of roses, literally! i love all of josie maran's products. if you haven't tried her stuff yet, i highly recommend them. all kinds of goodness to your skin: repairs and reverses damage caused by the sun, improves skintone and fights signs of aging! also, i love how it keeps my skin moisturized, but not oily. great alternative to a primer and works w-o-n-d-e-r-s underneath makeup. oh and it smells good too! sounds so luxurious! i must try the rose water! do they sell that at sephora or just the website you linked? i don't know why but i'm still afraid of slathering oil on my face x_x. i really want to try that josie maran argan oil though.